Community members throughout Eagle County are being asked to take a few minutes to participate in an online survey to identify how best to implement climate action planning at the local level. 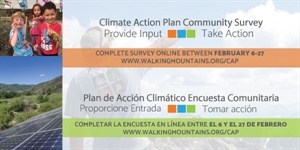 The survey, sponsored by the Climate Action Collaborative and facilitated by Walking Mountains Science Center, has been developed to gauge and benchmark community behaviors and attitudes when it comes to climate change and taking action locally to reduce greenhouse gas pollution. Visit walkingmountains.org/cap now through Feb. 26 to complete the survey. Part-time and full-time residents, business owners, homeowners, renters, second homeowners, climate change believers and skeptics alike are encouraged to complete the survey. A Spanish translated version of the survey is also available. The survey is for participants 18 or older and should take no more than 10-15 minutes to complete. Every person who takes the survey within the first ten days will be entered to win a $100 dollar gift card to City Market. In 2016 a group of over 30 stakeholders that includes representatives from the public and private sectors of Eagle County, came together to develop the Climate Action Plan for the Eagle County Community. After setting concrete goals and identifying groups to implement strategies, the collaborative project is now reaching out to the Eagle County residents it hopes to serve for public input and attitudes on the topic at hand. The stakeholders of the Climate Action Plan all agree they want the community to tell them how best to handle achieving the goals of the plan. “We wanted to give our diverse community an opportunity to tell us what they want to see and participate in. It takes an entire community to reach the goals set forth in the plan and we want everyone to feel they have a voice in the process,” says Kim Langmaid, founder, vice president, and director of sustainability and stewardship programs at Walking Mountains Science Center. If you have any questions about the Climate Action Plan for the Eagle County Community, contact Langmaid at kiml@walkingmountains.org or visit walkingmountains.org/cap.